OHIO -- An Apple Creek man has pleaded not guilty to animal cruelty for beating his dog in the roadway on May 14. Jacob C. Hershberger, 37, of 6976 Zuercher Road, was seen striking his dog with a lead rope on Zuercher Road, north of U.S. Route 250, at 8:45 a.m., according to the Wooster Post of the State Highway Patrol. Trooper Dan Laubacher said he was driving northbound on Zuercher Road when he saw a horse-drawn vehicle stopped in the northbound lane. Hershberger was behind the horse-drawn vehicle holding a dog down with one arm while using a lead rope to strike it with the other arm, Laubacher said. He and Sgt. Ty Richmond approached Hershberger, who said he was trying to teach the dog a lesson, Laubacher said. When they approached, Hershberger released the dog, which ran back onto Hershberger's property. "He stated he was upset with the dog and the fact it keeps walking away from his house into the neighbor's yard," Laubacher said. The incident may be the first time the Wooster Post has handled an animal cruelty case, said Lt. Chad Enderby, Post commander. The patrol has jurisdiction over the incident because it happened on a roadway. "It's the first time I've seen it, where someone was actually abusing an animal on a roadway where we have jurisdiction," Enderby said. "It's kind of an unusual incident for the Highway Patrol to handle." The case is scheduled for a July 1 bench trial in Wayne County Municipal Court. FLORIDA -- James Marinakis was trying to create a super-breed of dog called a Centurion on his 24-acre property west of Boca Raton, but his 59 dogs lived in cruel conditions, animal control officials said. Palm Beach County Animal Care and Control officers on Thursday seized the 59 dogs, five parrots and one horse from Marinakis' property on South 200th Street. The dogs, which included mixes of Shar-Peis, mastiffs and pit bulls, were kept in cages that were not even high enough for the dogs to properly stand and many had skin problems or bite wounds from fighting, said Capt. David Walesky of Animal Care and Control. One cage housed nine puppies that looked to be about four months old, Walesky said. "He's trying to create his own breed of dog," Walesky said. "To us, he just looks like a collector [hoarder] of dogs who can't keep up." Marinakis, whose history with Animal Care and Control dates back at least 10 years, has told investigators that he takes a "holistic approach" to caring for his animals and thinks they should be left alone. The horse that was seized had an infected wound that did not look like it was being treated properly, Walesky said. Marinakis, 57, was arrested and charged with five felony counts and three misdemeanor counts of animal cruelty. Two years ago, Marinakis pleaded guilty to a misdemeanor charge related to animal cruelty and was sentenced to probation. Investigators recently started looking into conditions at the property after Tri-County Humane Society officials received a complaint that there were dead puppies on Marinakis' property, according to his arrest report. 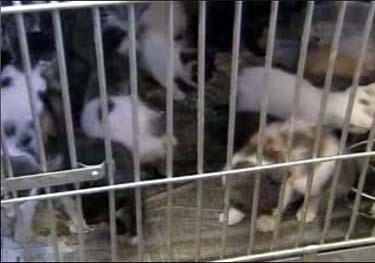 The 59 dogs that were seized will almost certainly cause crowding problems at the already busy shelter, Walesky said. "A lot of the dogs were kept in cages, they're not socialized and they don't necessarily enjoy being around people," he said. "They're not social or friendly dogs so they will be hard to place. The puppies are possibly adoptable." Walesky said the shelter has a wide variety of other dogs that are ready to be adopted, which would ease crowding. To contact Animal Care and Control, call 561-233-1200. VIRGINIA -- Jeannette Brady wasn't overly concerned when her 16-month-old son wandered away briefly last week. She wasn't immediately alarmed that the child had been knocked to the ground by a neighbor's dog in the seconds it took for her to catch up with him. 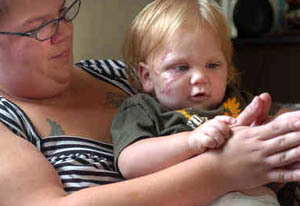 But what she saw moments later was something that still has her badly shaken--the dog, a pit bull, had ripped open little Jacob Brady's face, causing a wound that required reconstructive surgery and about 90 stitches to close. "This was a dog that [Jacob] and other children in the neighborhood had played with a million times," Brady said this week. "I would have never expected the dog to react the way it did." The brief but vicious attack took place last Wednesday in a trailer park on Potts Lane in Fairview Beach, King George Sheriff Moose Dobson said. The pit bull, Harley, is owned by a family that Brady said has been good friends with her family and lives a short distance away. The 15-month-old dog is currently quarantined, Dobson said. Its fate is yet to be determined. "It was a shock to everyone," Dobson said. "There had never been any complaints about the dog being aggressive before." Brady said she was outside with Jacob planting flowers last Wednesday, when she saw Jacob rounding a corner into the neighbor's yard. 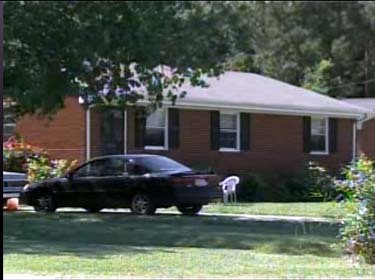 There is a vacant trailer between the two homes, but Dobson said there is little distance between the Bradys' and the dog's home. Jacob had reached the dog, which was on a chain, by the time his mother caught up with him. For no apparent reason, Brady said, the dog lunged at Jacob. Brady said at first she thought the dog had merely knocked the child down. Then she noticed her son was bleeding profusely. Brady said King George rescue workers responded quickly to her call and immediately made the decision to have the child flown to Inova Fairfax Hospital. There Jacob had extensive surgery before returning home a few days later. Brady said the child might need more surgery. Brady said it appears that Jacob will have no lasting scars from the incident, either emotionally or physically. The toddler plays with the family Weimaraner just as he did before. 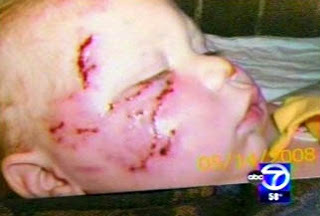 "His father and I are having a lot more trouble dealing with what happened than Jacob is," Brady said. Adding to the stress is the close friendship between the Bradys and Harley's owners. Brady said that even though they don't blame the owners and know that they are sorry, there is still a strain. Dobson said the case is being reviewed by the Commonwealth's Attorney's office, but he said it is unlikely that any charges will be filed. He said that while there are animal bites from time to time in the county, Jacob's was by far the worst in recent memory. 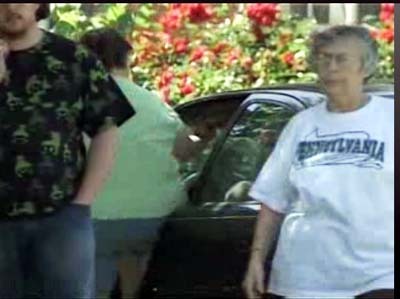 The Bradys moved to Fairview Beach about 4 years ago from Alabama. They also have a 5-year-old daughter. TEXAS -- A 7-year-old boy died after he was apparently attacked by two pit bulls along a road. Deputies had to shoot the dogs before they could reach him, authorities said. A driver saw Tanner Monk lying beside a road near Breckenridge on Sunday with two dogs nearby, Stephens County Sheriff Jim Reeves said. Tanner was found alone 50 to 75 yards from the house of a neighbor who owned the pit bulls. 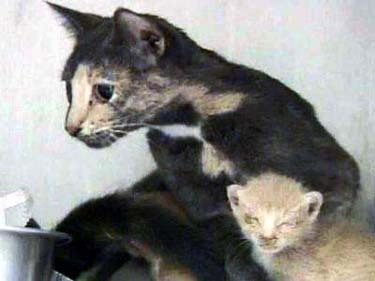 NORTH CAROLINA -- Wilson County animal control officers seized nearly four dozen cats from a home in the Black Creek community Monday after receiving complaints about a smell coming from the house. Investigators don't plan to charge the cats' owner, Dee Gaudet Burke, of 312 Mercer St., saying the animals did not appear to be neglected. Deputies say 48 cats and a dog lived inside the house; 47 cats were seized. 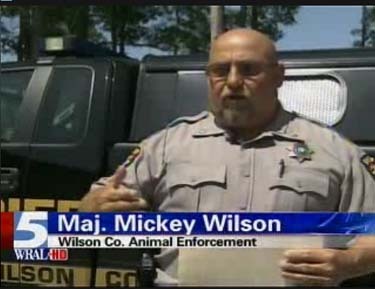 "They were being fed and cared for very much," said Maj. Mickey Wilson, with the Wilson County Sheriff's Office animal enforcement unit. "The adult cats are very very healthy. They really loved the animals." 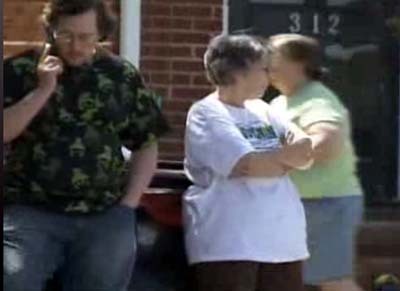 This is a huge mistake and shows how little law enforcement agencies understand about hoarding. Living in home full of feces, urine, pet hair, fleas, ammonia levels so high it could be smelled from the street, etc. with dozens upon dozens of animals is NOT healthy. Let's get real - no one who hoards animals really ever spends a day in jail. If you don't want to criminally charge her, fine, but FORCE her and her "three adult children" (these are either children or her children's spouses: Raymond Burke, 37, Theresa Burke, 42, and Joe Burke, 40) who also lived there among the squalor to get long-term mental health counseling. The recidivism rate for hoarding - without mental health intervention - is 100%. They will do this again. Wilson said animal enforcement received a complaint about the smell over the weekend and when they visited Monday, determined conditions were not sanitary. "When we parked at the road, you could actually smell the odor from the house," Wilson said. 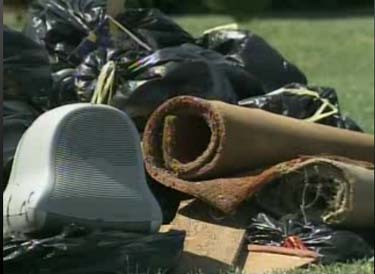 Inside, the home was covered in urine and feces. Wilson said Dee Burke, who lives at the house with her three adult children, could have been forced to pay more than $300 in fines and court costs for each cat but agreed to surrender the animals, instead. "They were very cooperative, and that's why were trying to work with them on that – trying to get everything cleaned up and help them," Wilson said. None of the animals appeared to be abused, but they were covered in fleas and mites, he added. And their vaccinations were not up to date. Veterinarians are running further tests to look for any diseases. Abuse comes in all forms. 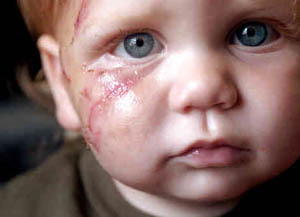 A child may not be beaten by its parents, but if it's covered in fleas and mites and living in a toilet with feces, urine and high ammonia levels inside a home - THAT'S ABUSE! 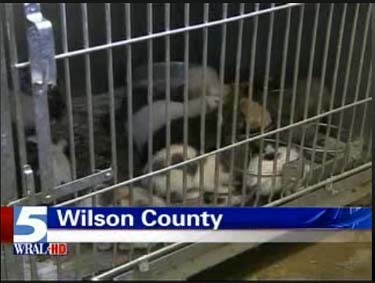 Wilson County animal enforcement and local rescue groups are working to find homes for as many of the cats as possible. Further medical tests will determine exactly how many are adoptable. NEW YORK -- A box turtle that has for years crawled through backyards in Williamsburg was discovered last week painted a sickly orange, with neighbors blaming construction workers next door with ample time and spray paint on their hands. 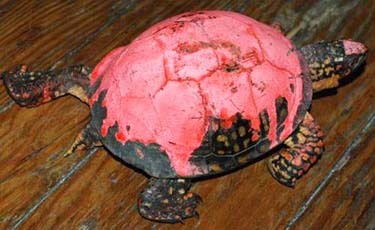 Photos of the poor turtle, known as Myrtle, in her new Technicolor shell were first posted on the blog The Gowanus Lounge, and caused a cascade of vitriol on the site. “Whoever did this should rot in hell,” wrote one commenter. “We live in a world of sociopaths,” commented another. Myrtle the Turtle was discovered painted orange in a backyard next to a development that has long been an irritant to longtime residents. They have complained of demolition work, cracks appearing in the walls of their homes, and ripped out phone and cable lines.